S I G N & D I G I T A L G R A P H I C S • April 2018 • 53 dryer will have a different feel than shirts that were placed in a heat press. They will feel more like a screen printed shirt. Heat presses press the ink smooth. 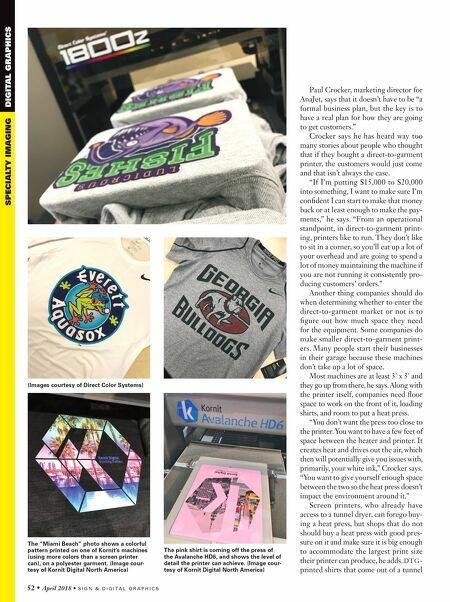 Michael Perrelli, marketing manager for Direct Color Systems, says that in addition to the printer and heat press, the direct-to-garment process requires a way to pretreat garments that are going to have a white ink base layer. "Some customers are also using a heat tunnel to dry the shirts if still wet with water after a post print heat press," he says. 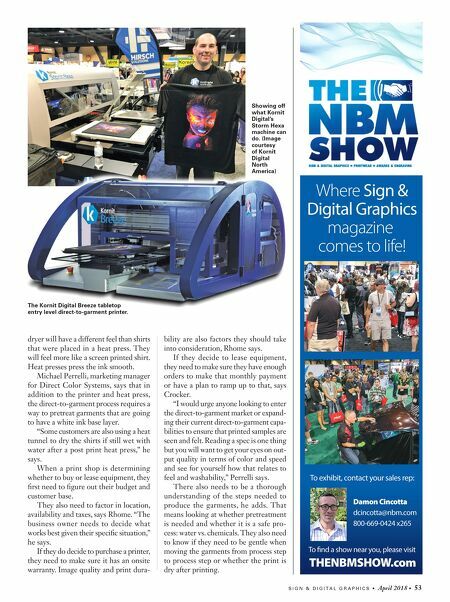 When a print shop is determining whether to buy or lease equipment, they first need to figure out their budget and customer base. They also need to factor in location, availability and taxes, says Rhome. "The business owner needs to decide what works best given their specific situation," he says. If they do decide to purchase a printer, they need to make sure it has an onsite warranty. Image quality and print dura- bility are also factors they should take into consideration, Rhome says. If they decide to lease equipment, they need to make sure they have enough orders to make that monthly payment or have a plan to ramp up to that, says Crocker. "I would urge anyone looking to enter the direct-to-garment market or expand- ing their current direct-to-garment capa- bilities to ensure that printed samples are seen and felt. Reading a spec is one thing but you will want to get your eyes on out- put quality in terms of color and speed and see for yourself how that relates to feel and washability," Perrelli says. There also needs to be a thorough understanding of the steps needed to produce the garments, he adds. That means looking at whether pretreatment is needed and whether it is a safe pro- cess: water vs. chemicals. They also need to know if they need to be gentle when moving the garments from process step to process step or whether the print is dry after printing. Showing off what Kornit Digital's Storm Hexa machine can do. (Image courtesy of Kornit Digital North America) The Kornit Digital Breeze tabletop entry level direct-to-garment printer.